The Brontë sisters are ripe for parody, what with all those sodden clichés and musty tropes about rainy moors, gloomy houses and heart-flutteringly handsome bad boys. Their literary output was certainly impressive, but it’s their autobiographies that gave rise to the cult of Brontë. None of the children lived to see forty, so they have the high romanticism of early deaths on their side. They also had an intense, isolated childhood, retreating into a fantasy world of their own imaginations to escape the bleakness of their surroundings. They took themselves very seriously, so naturally they make great subjects for comedy. 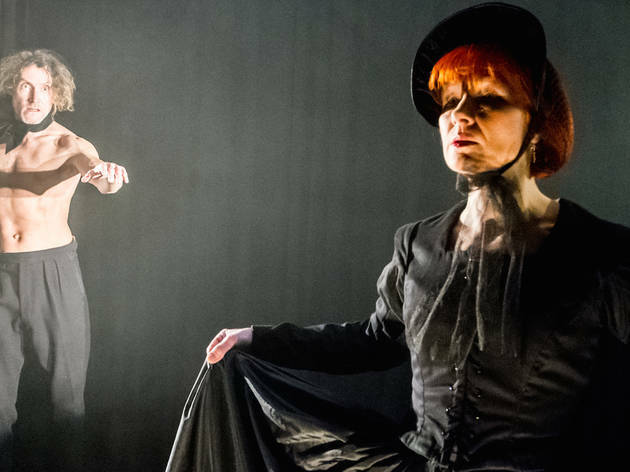 Not that playwright Jen Silverman is entirely mocking in The Moors, her strange and subversive riff on the themes and imagery of the Brontës’ lives and works. She tells the story of sisters Agatha (Alex Aldrich) and Hudley (Anna McCarthy), marooned together in a mournful manor, with their brother Branwell bricked up in the attic. A governess, Emily (Zoe Boesen), arrives, seduced into the position by the raunchy letters of Branwell. At least, that’s what she believes. 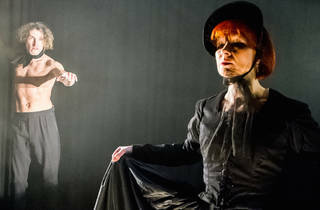 The house is serviced by Margery the parlour maid, and Mallory the scullery maid, although in reality they’re the same person, played with stooping physicality by Grace Lowry. She’s got typhoid or is pregnant, depending on what room she is in. This is a curious detail, because Charlotte Brontë died of typhoid and was pregnant at the time of her death. The play contains many echoes like this, funny at first but increasingly haunting. In a counter narrative, the family mastiff (Dion Mills) falls in love with an injured moor-hen (Olga Makeeva) and nurses her back to health. He’s intensely possessive and insecure, and she’s constantly in fear of being eaten. In the first act, this relationship feels turgid and irrelevant, but the actors grow beautifully in the roles and the second act resolution is brilliantly dark and sad. All of which makes the play sound rather severe and earnest, and perhaps on paper it may have been. So it’s a stroke of genius for Red Stitch to employ Little Ones Theatre’s precociously talented Stephen Nicolazzo to direct. He brings along his own actors too, with Aldrich and Boesen setting the tone of arch cynicism from the outset. Aldrich is magnificent as the bullish and intractable Agatha, every puff of her cigarette and swivel of her head an exercise in microscopic precision, and Boesen is flawless as the initially tremulous but increasingly forthright governess. As Hudley, the hopelessly forlorn and gawky younger sister, McCarthy is a riot, all teen angst and pathetic self-regard that morphs into murderous zeal. Nicolazzo’s regular designer, Eugyeene Teh, brings his tasteful flair for colour and simplicity to the chartreuse curtained set, and his stylish costumes convincingly convey the period while teasingly adding contemporary touches like a pair of converse. Katie Sfetkidis’ lush lighting and Daniel Nixon’s witty sound add dramatic flourish to the tiny playing area. It may seem a curious decision to halve the limited space of Red Stitch, but the result is to telescope and heighten the already lurid melodrama. Nicolazzo is one of this country’s most exciting and compelling directors, recalling a young Barrie Kosky, minus the juvenile obsessions with shock and genitalia. His aesthetic is becoming distilled and mature, but he has lost none of the cheekiness and energy that made his Dangerous Liaisons so much fun. He’s determinedly contemporary – the pop culture references and in-jokes fly around the stage – but he also harks back to the knowing provocations of Joe Orton and Oscar Wilde before him. He knows how to take a gesture to the edge of its usefulness, tipping it slightly into caricature before pulling back to something surprising and true. It’s great to see he and fellow conspirator-in-camp Teh so comfortable at Red Stitch, and there’s every indication he’ll conquer MTC and Opera Australia in time. Catch his work now in an intimate setting with affordable ticket prices; he may soon be out of our league. See what else is on stage in Melbourne this month.